The Bosch HDH183B 18V EC Brushless Brute Tough 1/2 In. 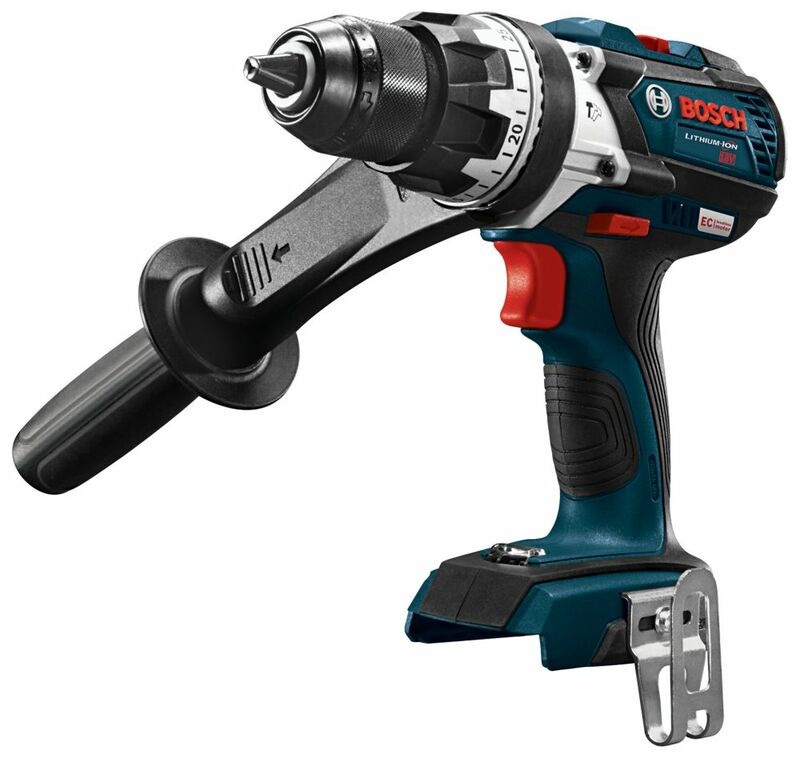 Hammer Drill/Driver features KickBack Control and a precision clutch. KickBack Control is an integrated acceleration sensor that automatically shuts the tool down when a potentially dangerous rotational torque reaction occurs in a bind-up scenario. The precision clutch has 25+1 settings, for reduced over tightening, fewer damaged screw heads and a longer tool life. Its efficient EC Brushless motor delivers outstanding runtime and longer motor life. It generates 663 In.-Lbs. of torque and a no-load bpm of 0-31,500. This drill has a variable-speed selector, designed for high-torque driving (0-480 rpm) or high-speed drilling (0-2,100 rpm). With an upgraded, all-metal chuck, the drill has great bit grip and torque transfer. The HDH183 features Bosch's Electronic Motor and Cell Protection, tough Durashield housing, an LED for illumination and a long belt clip. This is a bare-tool kit; the battery and charger are sold separately. The Bosch HDH181X-01L 18 V Brute Tough Hammer Drill/Driver produces power for a variety of materials, including concrete block and masonry. It delivers 750 In.-Lbs. of torque from the four-pole open frame motor. Active Response Technology diminishes the risk of harmful kickback in bind-up situations. Select between two speeds and 25+1 clutch settings for precise screw driving and improved drilling speed. Bosch's exclusive Durashield housing and an all metal gearbox stand up to rugged jobsite conditions. With a ProVantage three-year protection plan and the included L-BOXX-2 carrying case, this tool can bring the staying power. The DCD980M2 20V MAX Lithium Ion Premium 3-Speed Drill/Driver Kit delivers 3 speed variations allowing users to choose the level of performance needed for various applications. Powered by a high perforamance motor and bits are secured by heavy-duty 1/2-inch ratcheting chuck. 18V EC Brushless Brute Tough 1/2-inch Hammer Drill/Driver (Bare Tool) The Bosch HDH183B 18V EC Brushless Brute Tough 1/2 In. Hammer Drill/Driver features KickBack Control and a precision clutch. KickBack Control is an integrated acceleration sensor that automatically shuts the tool down when a potentially dangerous rotational torque reaction occurs in a bind-up scenario. The precision clutch has 25+1 settings, for reduced over tightening, fewer damaged screw heads and a longer tool life. Its efficient EC Brushless motor delivers outstanding runtime and longer motor life. It generates 663 In.-Lbs. of torque and a no-load bpm of 0-31,500. This drill has a variable-speed selector, designed for high-torque driving (0-480 rpm) or high-speed drilling (0-2,100 rpm). With an upgraded, all-metal chuck, the drill has great bit grip and torque transfer. The HDH183 features Bosch's Electronic Motor and Cell Protection, tough Durashield housing, an LED for illumination and a long belt clip. This is a bare-tool kit; the battery and charger are sold separately.